Accepted Scientific Name: Tillandsia recurvifolia Hook. Origin and Habitat: Argentina (Chaco, Corrientes, Entre Ríos, Formosa, Jujuy, Misiones, Salta, Santa Fe, Tucumán), Brasil (Rio Grande Do Sul), Paraguay (Alto Paraguay, Amambay, Central, Cordillera, Guairá, Ñeembucú, Paraguarí, Presidente Hayes), and Uruguay (Artigas). Its distribution covers many hundreds of square kilometres. Altitude range: 0-2200 metres above sea level. Habitat and ecology: Tillandsia meridionalis is hardy and grows well under a myriad of conditions. A typical Tillandsia meridionalis habitat is the Great Chaco region of Paraguay and Argentina, both in hygrophilic and dry forest dominated by Prosopis spp.. This area receives precipation only two or three months a year, but torrential rains submerge the ground in large areas for weeks at a time. The terrain is mainly populated by scattered scrub bushes and trees. Tillandsia meridionalis grow epiphytically on other plants upon which they depends for mechanical support but not for nutrients, they fix on horizontal branches, on forks, cracks and thick bark where organic debris and atmospheric dust accumulate, they are also found on wires and cables where they may receive more light. Tillandsia meridionalis grows along with Tillandsia vemicosa Baker and the more noticeable Tillandsia duratii. Tillandsia meridionalis tends to grow singly or in small groups. Tillandsia stricta var. paraguariensis Hassl. Description: Tillandsia meridionalis is a perennial epiphyte bromeliad with silvery grey-green leaves. It may be simple or spreading through few branched horizontal rhizomes and forms miniature bundled clumps about 10-15 cm tall and wide. The long-lasting, brilliantly coloured inflorescence are surrounded with bright rose coloured scales or bracts with white lepidote tips and white petals. Note: This interesting tillandsia is well known in cultivation, but is also known under the name of Tillandsia recurvifolia. The two plants are very similar (if not exactly the same) and it is hard to tell apart one from the other by body characteristic. In accordance with the variability of the species Tillandsia meridionalis is invalid and nowadays considered as a synonym Tillandsia recurvifolia. Derivation of specific name: Latin 'Meridionalis' meaning 'of the south' or 'southern.' The species was probably named for its southern latitude range. Roots: Tillandsia are entirely Epiphite, and they have roots only in the state of seedling, these become fixing bodies as the plants mature. Rosettes. Stemless, silvery, lepidote, about 12-15 cm in diameter and height. The polystihous leaves are frequently secund, that is spiralled to one side. Leaves: Stiff, grey and recurved. Tillandsia called "air plants" absorb water and nutrients from the atmosphere. The foliage is covered by dense specialized peltate scales, which increase the reflection of sun radiation (decreasing the temperature) and permit the absorption of water and nutrients from the atmosphere. The peltate scales act as unidirectional water valves. They are capable of absorbing all the leaf surface water in liquid form, especially from the evening dew. Inflorescence: The scape is slender and long enough to exsert the simple inflorescence above the leaves. The imbricate, polystichous, and subglabrous floral bracts are bright carmine. Gradually the bracts open out and back while the white corollas emerge. The three petals of the corolla form a small tube with flared tips. Blooming season: This species flowers mainly in winter, in northern hemisphere it often blooms at Christmas. 5) Cabral, Elsa L. “Plantas epífitas.” in Arbo, M.M. & S.G., Tressens (ed.). Flora del Iberá. EUDENE. Buenos Aires. 179-199. 2002. 6) Medina, E. “Ecofisiología y evolución de las Bromeliaceas.” Bol. Acad. Nac.Ciencias, Córdoba, 59 (1-2): 71-100. 1990. Cultivation and Propagation: Tillandsia meridionalis is easy to grow, drought tolerant, and will thrive within a broad latitude of care conditions. Locate in a well ventilated place it is perhaps one of the best tillandsias for cultivation due to its tiny size. 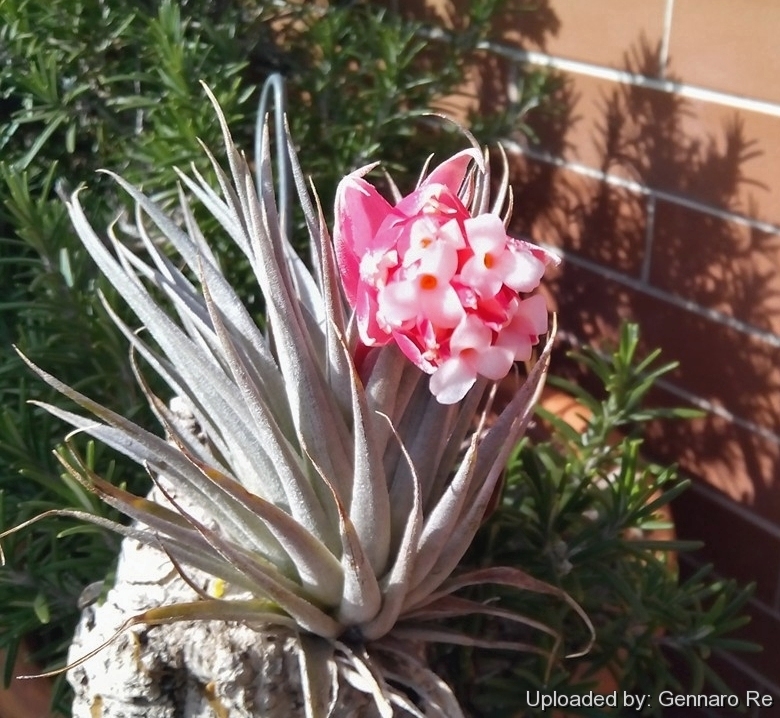 In addition to its durabililty, Tillandsia meridionalis has achieved great desirability among collectors because of its large, brilliantly colored bloom. Soil: This species prefers to be grown without soil mounted on wood or grown bare root on slabs of bark or tree fern fibre or on nearly any substrate. A and, if potted, it must be in a free-draining soil (i.e. leaf mold, peat and sphagnum added with perlite, sharp sand or orchid bark). pH Range 5,5 to 7,5. Although Tillandsia meridionalis does not root as quickly as some other species, it does eventually attach itself to the growing substrate. Exposure: The stiffness and greyness of the leaves indicate that Tillandsia meridionalis grows well in brightly lit areas. This in turn warrants more frequent watering to maximize growth in hot, dry locations. In a dark location the plant will gradually weaken and wither. Temperature: It must be grown in a frost-free situation in open air in the tropical and humid subtropical climates, with temperatures which it is good to keep over the 8°C, best 20-24°C. However its cultivation can be tried also in the warm temperate climates, in sheltered position, as it can stand, for short time, temperatures around the -2°C (but plants foliage will suffer little cold damage where frost settles on them). Winter hardy to USDA Zones (9b-)10-11. North of Zone 10, this bromeliad is usually grown in containers that must be overwintered indoors. Maintenance: Transplant them in spring. Traditional uses: In popular medicine an infuse of flowers of Tillandsia meridionalis is taken against heart pain, the decoction of flowers of Tillandsia meridionalis is recommended for post-partum haemorrhage.